One of the most historic places in the very recent history of Europa is the NEWBORN monument in Kosovo. The capital Pristina revealed the letters at the moment that the (former) province of Serbia declared their independence. The city isn’t directly a beautiful monumental city. But because Pristina (Albanian: Prishtina, Serbian: Priština) is the center for the international community (UN, EU, NATO), government, media and the student life, the capital breathes the most the ‘new Kosovo’. The NEWBORN monument symbolizes this. The first five years of independence, the monument letters were yellow. It became cool to write your name on one of the letters. 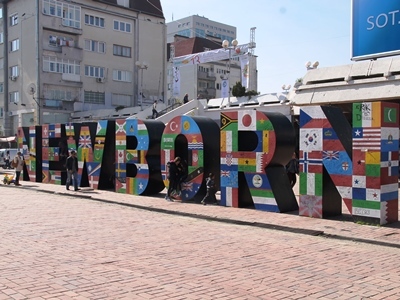 When Kosovo celebrated their fifth year of independence, the seven letters were painted into the colors of all the flags of the countries that recognizes Kosovo. Since then, every year, the statue changes in other colors. Rita Ora gave the symbol of Kosovo independence world fame. She danced upon the statue in her video clip Shine ya Light. The singer got several number one hits in the United Kingdom. In the video clip, Rita Ora wears a Kosovar flag, which wasn’t very known in the world at that moment. After writing down your name at the monument and making some family pictures, you have another statue to visit. Bill Clinton waves at you, ten minutes away from NEWBORN. Without the former U.S. President, Kosovo would probably never had their status of independence. If you want to experience that feeling of freedom, walk up to the Mother Teresa Boulevard. The street is in the very center of Kosovo capital Pristina. Cool restaurants, charming students, government workers in suits and sparkling fountains. Although most of the country is not like this boulevard, it is an expression of a newborn nation.